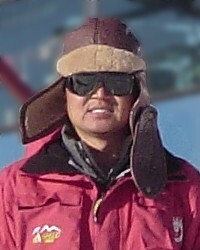 Sun Bo Sun Bo is an Antarctic glaciologist, who specializes in geophysical surveys of the Antarctic ice sheet. His research interests include glacier and ice-sheet dynamics, basal processes under ice bodies, active geophysical methods, sea ice, rapid climate change, and ice-sheet/climate interactions. He has spent several field seasons in Antarctica. During the 2004-05 and 2007-08 research seasons, he collected radio-echo sounding datasets from Dome A (the highest and most inaccessible region of Antarctica.) Study of this radar data, combined with numerical modeling, will allow a much fuller understanding of the glaciological conditions at Dome A, through which the final choice of a location of a deep ice core site can be evaluated. Dr. Bo also developed a system model to study basal ice-sheet radar reflections, and developed methods to detect weak internal reflections. He has also studied the strong internal reflection in East Antarctica. Sun Bo has participated in more than 10 expeditions to high elevation glaciers on the Tibetan plateau and the Tienshan mountain range, made three inland traverses across the Antarctic ice sheet and has also visited the Arctic. Earlier in his career he worked in the ice core and cold regions environment laboratory in the Lanzhou Institute of Glaciology and Geocryology (LIGG), Chinese Academia of Sciences, before joining and now heading the division of glaciology in Polar Research Institute of China. He remains a visiting research scientist at the Bristol Glaciology Center, School of Geographical Sciences, University of Bristol, United Kingdom. Dr. Sun Bo received his BSc in 1988 from the Department of Electrical Engineering, Xi'an Jiaotong University and his MSc and Phd (1996) at the Lanzhou Institute of Glaciology and Geocryology (LIGG), Chinese Academy of Sciences.